After a few days in Sydney, we were on the move again. This time to the far north of Queensland. We flew to Cairns, picked up a rental car at the airport and immediately drove on to Port Douglas, our base for the next few days. Queensland is a huge state and home to some of the very finest beaches and islands in Australia, if not the world. We only had a few days and took the decision to miss incredible destinations such as the Whitsunday Islands, and Fraser Island. They’ll just have to wait for another visit. Instead, we were heading directly to the area of the Great Barrier Reef. Port Douglas is a small town but it’s clearly very much a resort town. Packed with restaurants and souvenir stores, tourism is obviously its biggest industry. We stayed at a small apartment complex about a 5 minute walk from the beach. The beaches are long and fronted by palm trees. 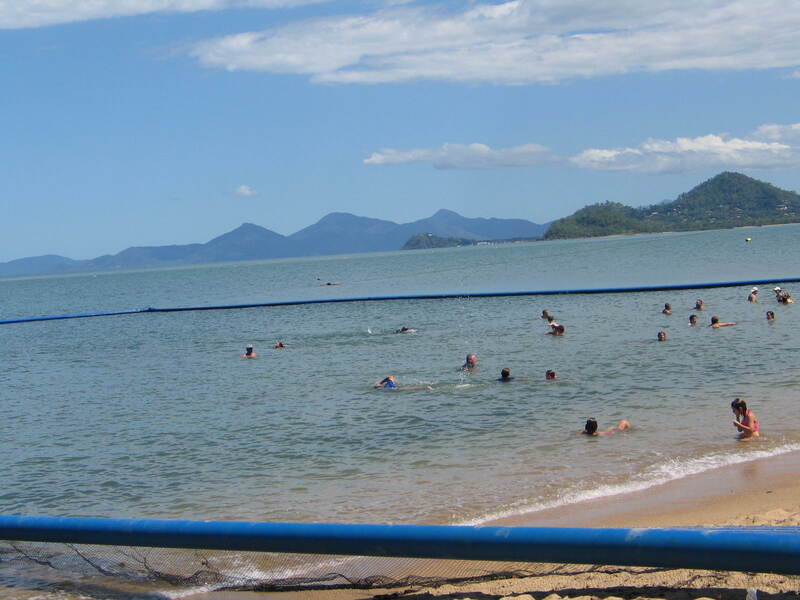 However – we were there in January – peak summer and therefore the most dangerous time of year to swim off North Queensland beaches. 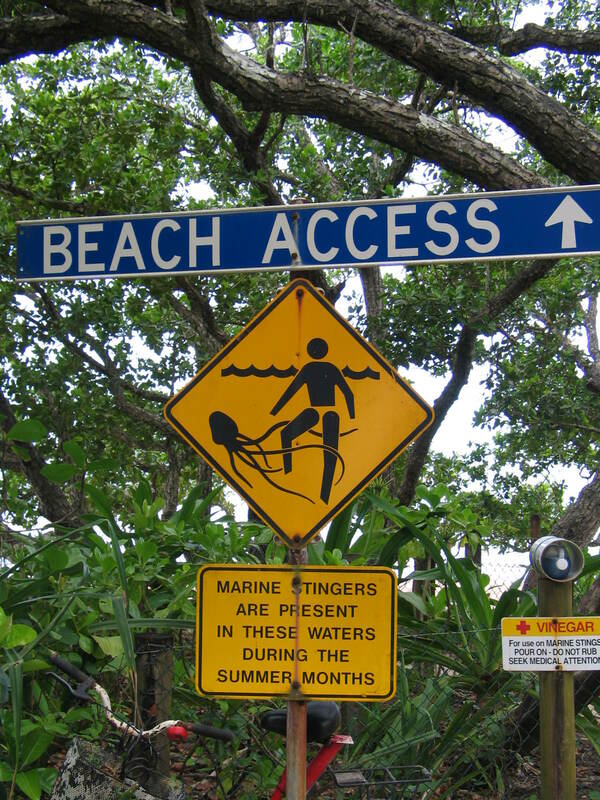 It is the time of year of the infamous Box Jellyfish, the most dangerous jellyfish in the world, which is all but guaranteed to kill you if it stings you. The Australians, as always, are extremely resourceful, and have come up with the equivalent of a blow up garden pool for the sea. It’s not quite this – rather, they have long plastic barriers extending in a u shape out to sea and making an enclosure – these barriers prevent the jellyfish from drifting into the enclosure, and one can freely swim in this little protected piece of sea. It works well and we did manage to really enjoy our time at the beach. Being such a tourist center, there is a huge amount that one can do in the area. We visited the Kuranda forest – accessed by a cable car, where we went on an interesting guided hike around the forest. 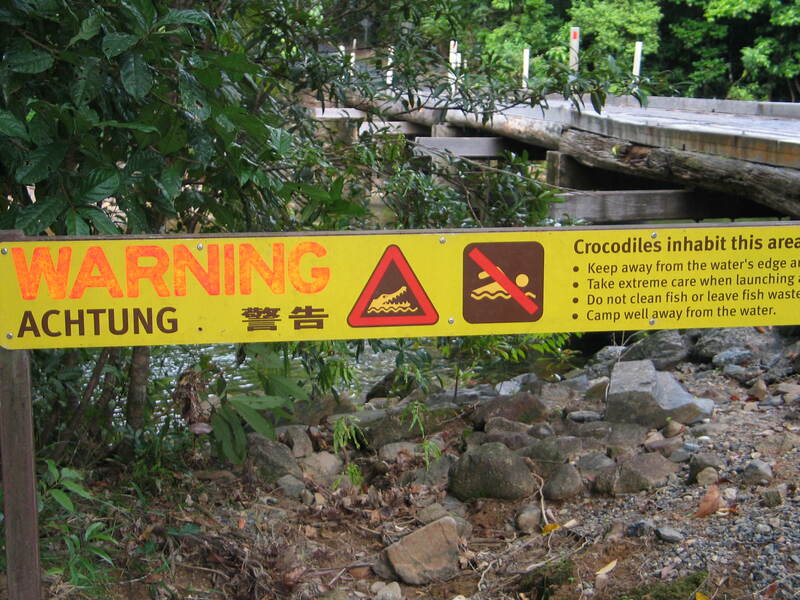 We visited a butterfly sanctuary, and a crocodile farm. 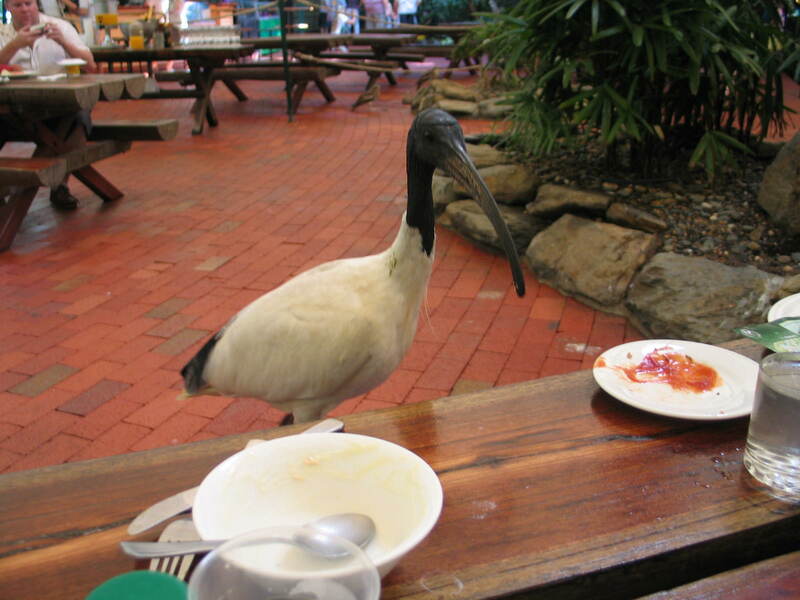 We also visited the Wildlife Habitat, to see more Aussie animals, and had Breakfast with the Birds, a breakfast where you are surrounded by tropical birst. all wanting some of your food! Sure, it’s all very touristy, but with kids, it’s a lot of fun. We did not make it to the Aboriginal Park (where one could learn to play the didgeridoo and learn to throw spears), simply as we had seen a lot of aboriginal life in the Outback. We took a day boat trip out to the Great Barrier Reef. It was spectacular, though not completely suitable for very young kids. The current was strong out at sea, and we found that we had to be able to swim well in order not to get swept too far from the boat. The fish and coral, were of course, incredible! (Some operations have their own private pontoons and operate semi- submarines,, making it easier to see the fish for non- swimmers. We had opted for a more low key boat). One of our breakfast friends. We also drove for a day to the Daintree, the oldest surviving tropical rainforest in the world. It’s beautiful, and potentially deadly, We saw signs warning us of jellyfish, crocodiles, emu (which can be dangerous) and we saw tons of beautiful flowers and plans, including pitcher plants, which are carnivorous. 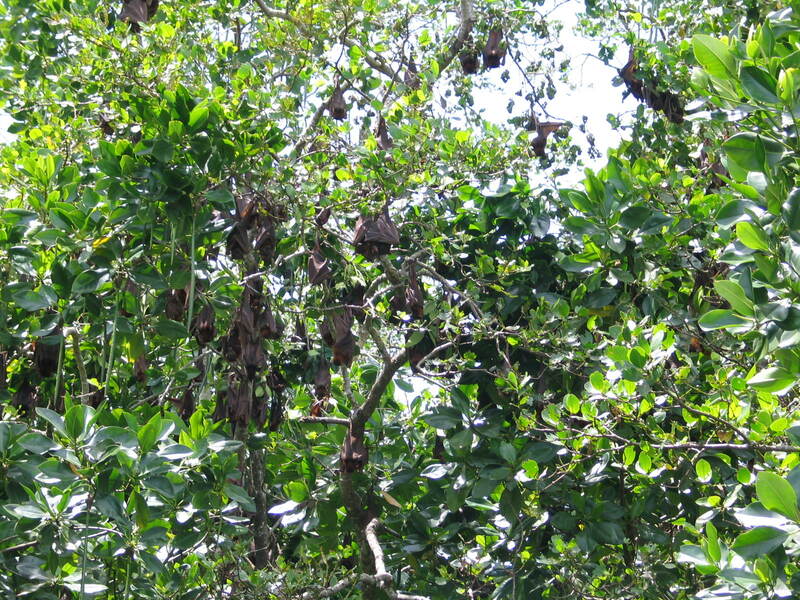 We visited Cape Tribulation, made famous by Captain Cook, and walked amongt the mangroves. It’s very wild country. After a few very busy days around Port Douglas, we spent a night in the Atherton Tablelands, the highland region just behind the coast. 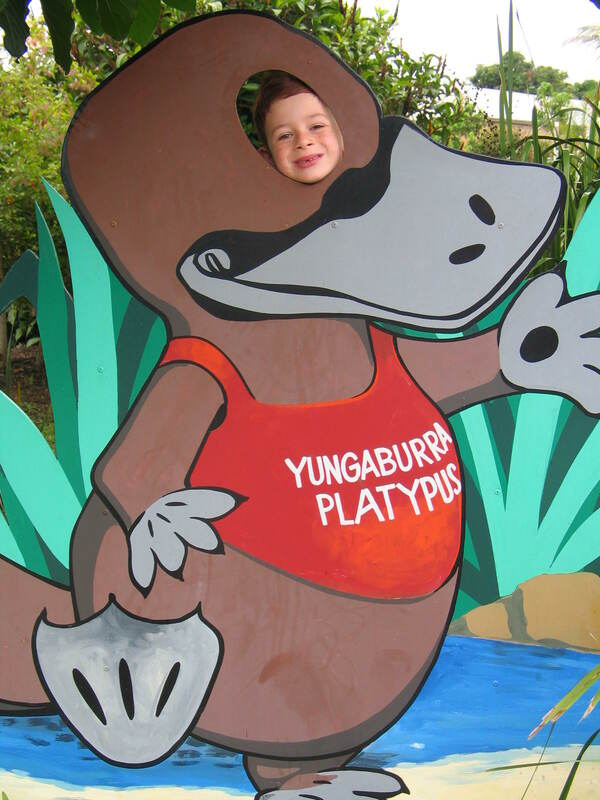 We stayed in a very typical Aussie town called Yungaburra, famous fo its duck-billed platypus viewing. We went twice to the viewing site and didn’t see anything. You just can’t rely on wildlife to show up on schedule! We swam in waterfalls, and really had a great time. When it was time to leave, we drove down a steep mountain road, full of s – bends, that had the kids vomiting in the back of the rental car. It was real mess when we returned it. Queensland was very touristy, but it was lots of fun. Highly recommended for families! PS: I plan great trips to destinations on five continents. For more details. click here. The only platypus we saw in Yungaburra!